HOUSTON -- Astronauts may need to temporarily withdraw from the International Space Station before the end of this year if Russia is unable to resume manned flights of its Soyuz rocket after a failed cargo launch last week, according to the NASA official in charge of the outpost. Despite a delivery of important logistics by the final space shuttle mission in July, safety concerns with landing Soyuz capsules in the middle of winter could force the space station to fly unmanned beginning in November, according to Michael Suffredini, NASA's space station program manager. "Logistically, we can support [operations] almost forever, but eventually if we don't see the Soyuz spacecraft, we'll probably going to unmanned ops before the end of the year," Suffredini said in an interview Thursday, one day after Russia lost a Soyuz rocket with an automated Progress resupply ship bound for the space station. A Soyuz rocket crashed Wednesday minutes after lifting off from the Baikonur Cosmodrome in Kazakhstan. The third stage of the Soyuz-U rocket was firing when something caused the vehicle's RD-0110 engine to turn off early, scattering debris in the Altai region of Siberia more than 1,000 miles east of the launch site, according to Russian media reports. The Soyuz-U's third stage is almost identical to equipment used on the Soyuz-FG booster that propels human crews into orbit, according to Roscosmos, the Russian space agency. The problem Wednesday occurred nearly five-and-a-half minutes after liftoff when the rocket detected a low fuel pressure reading, according to Suffredini. "They have data showing that the engine was shut down due to what looks like low pressure on the fuel side. They saw data all the way down to when the vehicle broke up," Suffredini said. "In this case, they at least know where the potential anomaly area is, so they can focus their attention there." The Russian space agency set up a board to investigate the cause and recommend corrective actions, while other groups were tasked with reviewing implementation plans for Russia's manned space program and checking the quality of manufacturing throughout the Russian space industry. "We will understand, to our satisfaction, the anomaly, what is believed to be the cause and how they resolved it," Suffredini said. "If we're not happy, we won't put our astronauts on the Soyuz." NASA astronaut Daniel Burbank and cosmonauts Anton Shkaplerov and Anatoly Ivanishin were preparing to launch to the space station Sept. 22, but that flight is likely going to be delayed until at least October in the wake of Wednesday's rocket failure. 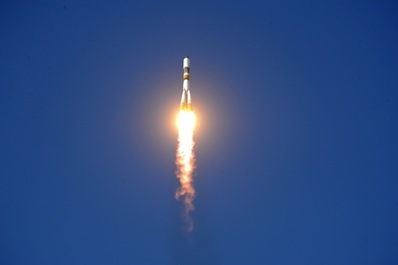 Wednesday's Soyuz launch mishap was the second rocket failure in a row for Russia. A communications satellite launched Aug. 17 by a Proton rocket was stranded in the wrong orbit due to an anomaly with the mission's Breeze M upper stage. Engineers will present data to space station management Monday morning that could lead to a formal decision to extend the stay of three astronauts on the space station beyond their scheduled Sept. 8 landing date. Space station commander Andrey Borisenko, Russian cosmonaut Alexander Samokutyaev and NASA flight engineer Ronald Garan launched to the complex April 4 and planned to depart the lab and return to Earth on Sept. 8. Officials could decide this week to extend their mission, according to Suffredini. 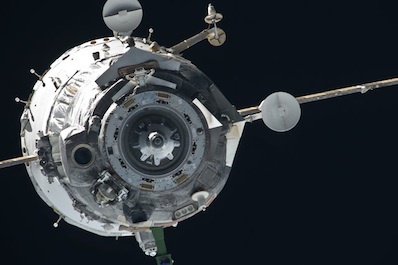 The crew's Soyuz TMA-21 capsule can stay docked to the space station for up to 210 days. Its design life expires in late October, and Suffredini said he expects no problems continuing their mission until then. The other half of the station's six-person crew -- NASA flight engineer Michael Fossum, Russian cosmonaut Sergei Volkov and Japanese astronaut Satoshi Furukawa -- are supposed to return home Nov. 16. "The November crew has a little different issue," Suffredini said. "If we're not launching by then and we have to de-man space station, we pretty much have to do that probably by about the middle of November." That crew's Soyuz capsule, named Soyuz TMA-02M, blasted off June 7 and would need to land in late December or early January. "One of our requirements is to land in daylight, and it has to be an hour from sunset or sunrise," Suffredini said. "On Nov. 19, we reach that cutoff and we go dark." The next daylight landing window opens in late December, but NASA and Russian officials worry about extreme winter weather conditions in the Soyuz landing zone on the steppes of Kazakhstan. "The weather is severe out there in the winter time," Suffredini said. "So from a search and rescue standpoint, that's probably something we don't want to do. Even if it's within our requirements, we probably don't want to be landing two hours before sunset. If we had any problem at all, we would be searching for the crew in a blowing snow storm in the middle of night." 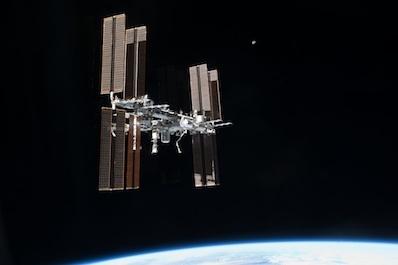 Space station control centers in Houston and Moscow are equipped to monitor and operate the $100 billion laboratory from the ground, but retreating from the outpost would halt promising medical research and break a string of almost 11 years of continuous manned operations. "I suspect that if we get close to Nov. 16 and we haven't flown a Soyuz yet, and by then we will have stepped down to three crew, we'll probably de-man the ISS and go to unmanned operations," Suffredini said. Russia is expected to present a recovery plan this week outlining tentative dates for launching the Soyuz rocket again. One scenario under consideration would see at least two Soyuz rockets with the RD-0110 third stage fly before the next manned launch. A commercial launch of six U.S.-owned Globalstar communications satellites was scheduled for early October, and Russia could move forward the planned launch of the next Progress cargo freighter from late October to earlier in the month. "That would be a philosophy that says let's go fix the problem and get a couple of test flights under our belt before we fly crew," Suffredini said. "You have to keep in mind we won't fly with this anomaly. We won't fly knowing we have this anomaly. I expect to determine root cause, repair root cause and fly these flights." Russia quickly recovered from a deadly rocket crash in 2002 and launched a crew of three space fliers two weeks later. "I fully expect our Russian colleagues will resolve this anomaly in a timely fashion, and I expect them to do it in a safe fashion. Having the data they have on the anomaly is just fantastic," Suffredini said. "I would expect you would hear us say something along the lines we'll fly this commercial flight, we'll fly the Progress with the hopes maybe of flying a Soyuz by the November timeframe if everything works out."